So who would open a Ford Dealership in Lansing? Posted in: Business, Lansing History, People, Sports. Tagged: Baseball, Fred Blanding, Frederick James Blanding. Clark Carriage Works circa 1904. The office building, the three-story structure to the left was torn down in 1926, the rear of the building, barely visible survived. The angled building to the right housed the wheel storage section and the packaging and shipping plant. The buildings that once stood at 235-237 make for interesting viewing. The site once was the home of Clark Carriage Works, famous for the fine carriages it produced but also for creating the first body for Ransom E. Olds’ horseless carriage. On July 4,1906, the Clark Factory was partially damaged by fire, but was quickly rebuilt, the firm was engaged in the production of carriages and bodies for Oldsmobile. In 1911 Lansing Wagon Works purchased the Clark & Company Carriage Works. By 1912 part of the plant was acquired by the Lansing Sanitary Ice Company (LSJ 3/25/1912) Later, in 1919 John Bohnet Company, manufactures of truck bodies and automobile accessories acquired the Clark Plant (LSJ 6/12/1919). The John Bohnet Company was acquired by the Briscoe Motor Company of Jackson, Michigan in 1919-1920. Notice the location of the John Bohnet Company and the Lansing Sanitary Iceless Plant. Sanborn Map 1913. So, you may be asking yourself, what does this all mean. Well this whole post is centered around a 1939 image of the property. The background may not seem important, but it is. This was one of the most important structures in the history of Lansing and no attempt was made to save it, by either city government or the public. Is it odd or just me, that the plant that was so integral to the birth of the automobile industry just leveled? No one seemed to care, so much for history. In 1926, the office building for Clark Carriage Works was torn down and replaced with the new structure by F.J. Blanding, ironically Lansing’s first Ford dealer. (LSJ 6/3/1926) What is important is that the eastern part of the Clark Carriage Works survived. Years later in 1948 that area that was the gas station was enclosed and converted to office and showroom space (LSJ 2/15/1948). Alas it was not to survive, in December 1962 the building was torn down and replaced, with you guessed it a parking lot (LSJ 12/27/1962). Today it is the site of the Grand Tower. 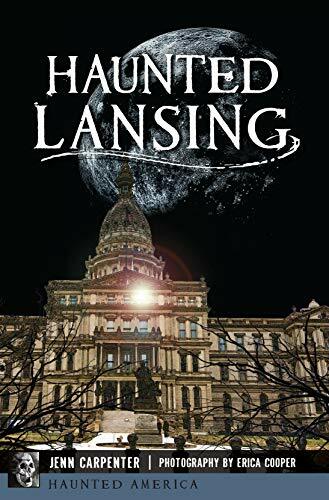 So instead of examining the life of Frank Clark or John Bohnet, both of whom are well known in Lansing, I thought it would be interesting to review the life of Fred J. Blanding, Lansing first Ford Dealer. Frederick James Blanding Jr. was born in Redlands, San Bernardino, California, on February 8, 1888 to Frederick James and Emma (née Sly) Blanding. Tragedy had struck the family, just eight days prior to young Frederick’s birth when his father died. Fredrick’s mother Emma, decided to return to Michigan and settled in Bloomfield, Michigan where her parents lived. Frederick (Fred) attend Detroit Central High school and the University of Michigan where he was a standout pitcher. He was drafted by the Cleveland Naps in 1910 and is best known for his first outing when he faced the future Hall of Famer, Walter Johnson. Fred threw a 6-hit shut-out and the Naps won 3-0. Fred’s career was quite varied and to save time it is far simpler if one reviews the excellent Wikipedia article on Fred Blanding’s baseball career. Let’s just say Fred left baseball under his own terms and deserves a lot of respect for that. When his baseball career ended, Fred opened a Ford dealership in Lansing, Michigan, the home of Oldsmobile, REO and later Durant Motors. That took some guts. On a personal note, Fred married Miss Clara M. Shields on November 28, 1914 in Cuyahoga, Ohio, the couple had three children; George, Robert and Katherine. Not only was Fred involved in business, but he kept a hand in baseball, serving as president of the short lived, Lansing Senators and helping to teach young pitchers at Lansing Central High School. In 1935 Fred and his family left Lansing and moved to Roanoke, Virginia where he worked for a variety of automobile dealerships. Frederick James Blanding died of a heart attack on July 16, 1950 (Daily Press, Newport News, Virginia 7/18/1950).